Rafa started week two with a demolition of Denis Istomin, 6-1, 6-0. Transcript of the post match press conference from ASAP Sports. Q. It was a very good match for you, obviously, finishing in just under an hour. How sharp did you feel out there? RAFAEL NADAL: Good. I think I played a very complete match in general. Q. Just talk about how well you played today. 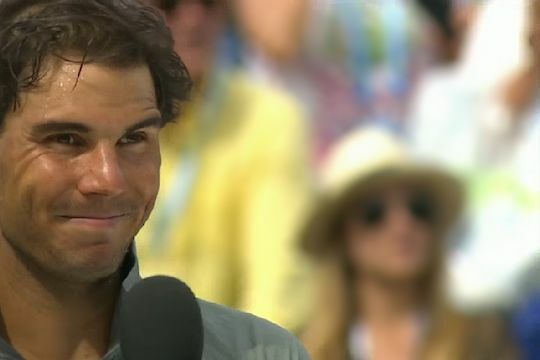 RAFAEL NADAL: Yes, I think, as I said before, I played a very complete match. Talking about the things that you can do well in the tennis court, today I think I did the most ‑‑not every one because not match is perfect, but I did a lot of things very well. No mistakes, serving with good percentage, and playing a lot of winners. My movements were better than what I did last event events. That's a very important thing for me. I am happy to be in that fourth round, winning not against an easy opponent like Istomin, a tough one, that way. It's impossible win with that result if I don't play well. Q. If you could talk about your next opponent. RAFAEL NADAL: He's an opponent, very uncomfortable opponent. He's an opponent that is playing great. He has an amazing talent. Great forehand, great backhand, especially the forehand, but he's able to hit winners from every part of the court. So he's an opponent sometimes that can be unpredictable, and is difficult to play against these kind of players ‑ especially when they are playing well and Fognini is playing well. I need to try to let him play with‑‑ if he wants to play, try to find the winners, and I need to try to let him play from not easy positions. If he's playing with comfortable positions will be very difficult for me. Here's the video of his press conference. He next played Fabio Fognini, and thrashed him, 6-2, 6-2. Q. You'll need to get your ears fixed from all the noise on the court. RAFAEL NADAL: First three matches I was able to find the right rhythm on court, playing aggressive, playing with no mistakes, so today was a little bit strange match. I am sorry for Fabio. I think he felt a little bit, I don't know how to say, but he felt a little bit close to the hip, something from yesterday. So was not easy for him to play that match. But anyway, I think I managed well the situation. The wind, it was hard tonight, and I was manage to do well. So I think I played the right match. Q. With Fabio, the way he plays and he gets so animated, the arms and the racquets and all that, do you have to concentrate a little bit harder when you play somebody like him? RAFAEL NADAL: As every day, you know, I have to try to find my rhythm, try to think about myself, what I have to do well, so I just try to be focused on what I really need to do to play well, no? Then the opponent is free to do whatever. Tonight was not an easy match for him, for the conditions that I told you before. So it was a little bit strange, but in general, I think I was very focused and solid with my serve. That's very important thing for me, my game, when I am playing on hard. Q. Do you look ahead to playing Raonic in the next round? 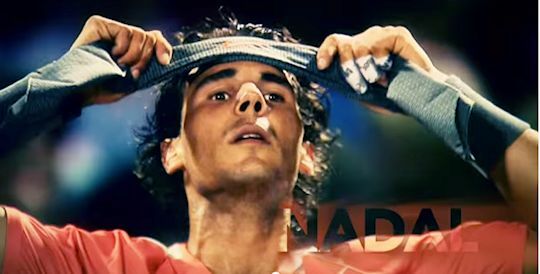 RAFAEL NADAL: Yes, he's a very dangerous opponent, an opponent that you don't want to meet. His serve is huge, one of the best without any doubt, and he's able to play very aggressive on the return because he doesn't feel a lot of pressure on his return because he knows that he's very safe with his serve, no? So I need to be very solid with my serve, very focused, try to move him around. That's the thing that I have to do, because he is able to play and in easy positions. His forehand is big, and it's true if I am able to move him then I can be a little bit an advantage. Problem is sometimes it's very hard to move the opponent when the opponent wants to hit every ball hard, and especially when he starts the point with that serve. Here's a hot shot from the match. On court interview after the match. Things got a lot tougher in his quarter final against Milos Raonic. 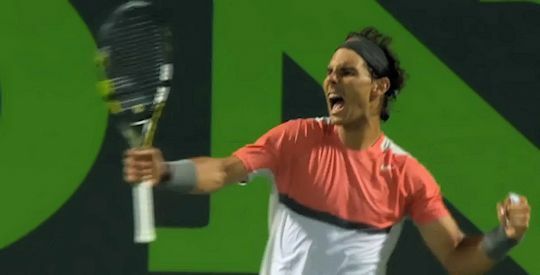 Apparently, the wind did not help Rafa get much rhythm and it took three sets to get the better of him, 4-6, 6-2, 6-4. Some of his comments in the post match press conference from ASAP Sports. Pre-final press conference, following the withdrawls. So that's fine. For me is very important result to be in the final of Miami, too, after Indian Wells be able to win the final and compete for the title in the tournament that I have a lot of friends, a lot of Latin crowd that support me a lot every day, and that's very important for me. To be in the final already are 600 points that for me, at this part of the season, are very important. Unfortunately, it was not an off day for Djokovic and Rafa lost the final, 3-6, 3-6. And now we move onto his beloved clay for the next couple of months.